The children run squeeling past the stage and around the corner, anxious to discover the Secrets previously known only to the Puppeteers. The Magic of the Theatre. I am possibly more excited than the children, trying to conceal this as an act of "grownupmanship." 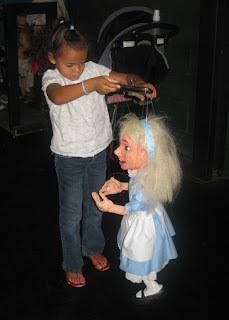 It's hard to admit "I am a grown up and I don't yet know the Secrets of the Puppeteer." Upon command, we stop and circle the old crone, the beautiful Queen Velanosa gone bad. The children are terrified of her ghastliness. Not I. I am brave. I scoot up close. My, my. What is she made of? Artistic Director, Lyon Forrest imitates her stance, teaches us about the old lady. It is then we learn a big Secret. The old crone has a revolving face. 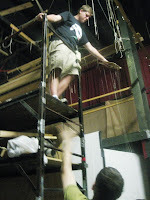 We see the bridge above her head and the puppeteer (Jason Laramee) commanding her every move. With a slip of his hand, the crone's face rolls back in her hood and she is again the beautiful Queen Velanosa, wickedly so. The children draw close. With a flip of Jason's hand, the head revolves again and the old crone is back. The children jump back. 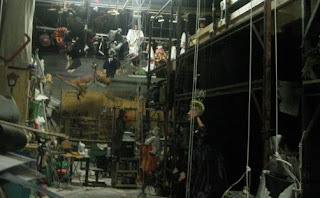 Leaving the crone swaying in the breeze, we walk further into the backstage area while the puppeteer walks above us on the bridge. We pass the hunter and the good Queen puppets, both lifeless... hanging in an eerie fashion. We see the puppets we know from former plays waiting patiently like a steward, waiting for a call to action. 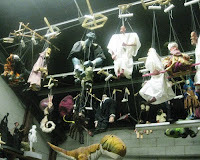 There are puppets in disarray, half clothed, half formed, headless, legless. There are tools strewn about as if we caught the puppet maker by surprise. Eva tugs my sleeve, "How do we see out front?" In my Wicked Witch voice I garble "Good question, my pretty." We round the corner to answer Eva's question. We see center stage revealed! Jason moves up the bridge to show us how it was done. He brings Snow White back to life, grabbing her strings, his hands moving furiously. She begins dancing. She is spastic as he demonstrates his skills. Puppeteer and Set Designer Kimi Maeda then explains how the dwarfs required some collaboration. 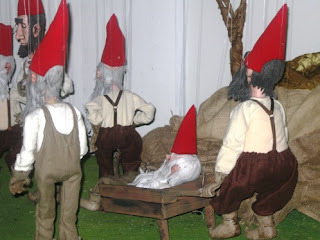 Because of the quantity of the dwarfs on stage at one time, the puppeteers had to double up and take on more than one puppet each. Eva is wide eyed with wonder. How? How can one person make the puppet move in so many ways? She simply must try it herself. 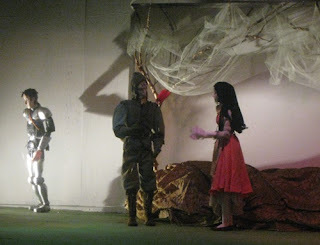 Thanks to the Columbia Marionette for yet another outstanding performance. These people love kids and love art and it shows. 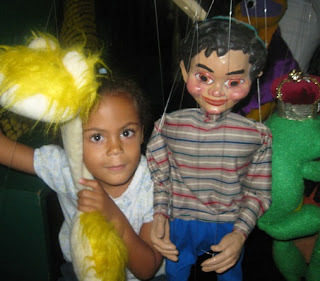 The puppet on the left is my favorite!